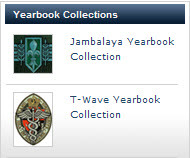 The Jambalaya and T-Wave are Online! La. 1.-MEDICAL DEPARTMENT OF THE TULANE UNIVERSITY OF LOillSIANA, New Orleans. Organized in 1834 as Medical College ol Louisiana, first class graduated 1835 and classes graduated each subsequent year except. 1863-65. Transferred to Medical Department University of Louisiana 1847, became Medical Department of the Tulane University 1884. La. 2.-NEW ORLEANS SCHOOL OF MEDICINE. Organized 1856, extinct 1870. La. 3.-CHARITY HOSPITAL MEDICAL COLLEGE, New Orleans. Organized 1873, extinct 1877. La. 4.-FLINT MEDICAL COLLEGE OF NEW ORLEANS UNIVERSITY (Colored), New Orleans. Organized 1889 as the Medical College of New Orleans University. First class graduated 1892 and classes graduated each subsequent year except · 1896. Name changed to the above in 1901. The dean is Dr. A. D. Bush, 1500 Canal St., New Orleans. Total enrolment for 1905-6 was 54; graduates, 8. Medical Department of Straight University, New Orleans, La. No instruction was ever given. Scan of the Louisiana pages from the AMA Directory 1906, available below. Information on the Louisiana Medical Practice Act. Passed by the State Legislature, July 13, 1894, and Amendment of 1896. Listing of Societies, State Board of Health, Medical Colleges, Hospitals and Sanitaria. Charity Hospital Reports (1842-1974) - Now Digitized! The Rudolph Matas Library of the Health Sciences at Tulane University would like to announce the online availability of the historic Charity Hospital Reports. These items are of use not only to researchers in the fields of medicine and health, but also those researching the history and cultural impact of medical care in the New Orleans area. A collection of Reports from the New Orleans Charity Hospital were produced regularly for the state government of Louisiana from 1842-1974. The reports have been digitized by the staff of Rudolph Matas Library under a National Library of Medicine (NLM) grant for a project titled Early Medical Journalism of Louisiana, A pilot project for the preservation and sharing of Nineteenth Century Medical Publications of Louisiana [National Library of Medicine (NLM) Prime Contract No. N01-LM-6-3505; HHSN276200663505C]. These reports include a wealth of material on hospital administration and disease epidemics as well as vital statistics and public health information. The Charity Hospital Reports collection consists of 114 PDF items, each with searchable text. The reports will also be included in to the LOUISiana Digital Library Collection of Collections (LCOC). 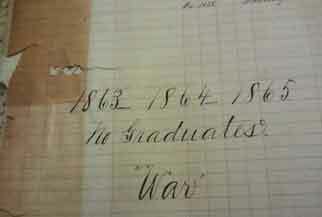 Matriculation records for the Medical College of Louisiana, University of Louisiana, Medical Department and Tulane University Medical School (are noted in a card file with name and year only) for years as follows: 1844-1850,1852, 1853, 1857-61 (63-65 not included),1866-70, 1873-75, 1877-78, 1880-1893. Print volume on Reference at the Matas Library. In 1909 the New Orleans College of Dentistry became the Dental Department of Tulane University. With the 1913-1914 session, the title was changed to the School of Dentistry of the College of Medicine. The school increased the dental curriculum from three to four years beginning with the 1917-1918 session. In 1925, requirements for admission were increased by the addition of a pre-dental year. Students spend the first two years on the University campus on St. Charles Avenue and the last two years in Hutchinson Memorial and at Charity Hospital. History of Dental Schools in Louisiana. Website of LSUHSC. School of Dentistry. The Matas Library keeps yearbooks, composite photographs and commencement programs in the collection. Please think of us if you have one of these items you wish to donate to the collection. he mission of the Tulane Medical Alumni Association is to promote the interest, welfare and advancement of the Tulane University School of Medicine, to advance the cause of medical education, and to maintain close and mutually beneficial relationships among the Tulane medical alumni, students and institutional leadership. An unpublished document written by Mary L. Ryan, titled: Historical journal resources of the Rudolph Matas Medical Library Tulane University (1978) is attached as a .pdf. The Matas Librarians provide historical information from our collections to the best of our ability. To request information on Louisiana's medical history, genealogy or biographical information for physicians please email medref@tulane.edu with the question and relevant date information. We do have limited staffing and resources and will provide this research as staff time is available. The collection is not open to the public, so please make an appointment prior to coming to the Matas Library of the Health Sciences. We do not charge for this service. Please consider making your interest and support of the Matas historical collections known by a letter of appreciation. If you are interested in making a donation towards the maintenance and support of the Rudolph Matas Library “historical collections”, you may contact either the Matas Library Administrative Office or the Tulane Office of Development.